Conference etiquette - Don't mention the ----! Conferences are all about communication. But what can and cannot be communicated at a conference, or rather what should and should not? Probably top of the list of "should not" is to use inappropriate examples or images to liven up proceedings. Recently I attended the 6th Joint Sheffield Conference on Chemoinformatics (more here at NM) and saw red when a speaker talking about ways to rank docking programs decided to use contestants in Miss World as an illustrative example, complete with pictures, references to "lovely girls" and "let's just treat them as objects". I noticed someone got up and walked out at this point. Meanwhile over in Vermont, the Gordon Research Conference on CADD was talking place at the same time. This particular meeting had a focus on the use or abuse of statistics with a goal to improve the situation. The thing is, GRCs are subject to the Chatham House Rule. Before I checked the Wikipedia link I thought that this meant that everything discussed at such a meeting is confidential, and I think this is the common understanding (see for example Peter Kenny's reference to this over at his blog). However, apparently it simply means that the discussions must not be attributed to anyone. Either way, probably more people misunderstand the Rule (like me) than understand it. I understand that this may be out of the control of the organisers, but it seems to me that this rule holds back the communication of the information to a wider audience: can you tweet the talks? can you post the slides? can write a blog post about the conference? can you even mention it to co-workers at coffee? Do people really present controversial work that needs protecting by the Rule? Poll question: Time for Python 3? By way of background, Python 3.0 was first released back in Dec 2008. Almost five years later, many are still using a Python 2.x version. For scientists, the main blocker was numpy, which only supported Python 3 since Sep 2010, but additionally IPython took until July 2011 and matplotlib has only this year (Jan) supported Python 3. 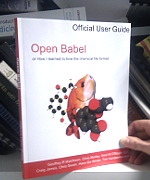 In cheminformatics, Open Babel has supported Python 3 since March 2009 but neither RDKit nor OEChem has yet added Python 3 support. However Greg is currently thinking about it (if you're for it, you can support this idea on Google+). It's interesting to look in more detail at the Windows downloads for the OB Python releases. For OB 2.3.1 released in Oct 2011, the ratio of Python 2 to Python 3 downloads is 4:1 (2.5:148, 2.6:238, 2.7:983, 3.1:41, 3.2:301) while for OB 2.3.2 released in Nov 2012, the ratio is 2.5:1 (2.6:81, 2.7:424, 3.2:73, 3.3:129). The trend is obvious but it seems that change is slow.